Selecting the appropriate hair products to complete your look. FYI, I go to the best hair salon in town. This was confirmed when they referred to the collection of products as my Hair Wardrobe. I knew with that comment that these are my people. Just like your usual wardrobe is comprised of your underwear to basics to jackets and everything in between, the same can be said about the products you use from start to finish on your hair – aka your hair wardrobe. Just like I can’t wear flare jeans (I seriously cannot, one time I’ll show you and then we’ll both LOL) I also can’t use products suitable for blondes or heavily oils as they weigh down my hair. I’ve purchased them in the past, lured in by the seductive copy in an attempt to sell it to me (and it worked) only to find that like flares, those products definitely needed to be gifted on. I think a lot of us are fooled into believing that great hair is something we’re born with. But I believe the products and our styling methods can make or break how our hair wants to behave. So it’s important to use products that appropriate to you, and not go by what all the glossy magazines say. It’s important you go to people that can look at your hair and tell you exactly what’s going on and work out a treatment plan accordingly. I mix and match products across several ranges because my hairdresser knows I love smooth hair with lots of bounce. If you’re in Newcastle, I go to Suki Hairdressing. Your hair is like your skin, so it’s worth getting proper consults every few months. We’ll often spend the time and money to get skin consults and buy products to help our current concerns, but how often would we pop into our salon and ask our hairdresser about something for our scalp concerns? It’s also important to communicate how you style your hair. For me, I love heat styling, so it’s important I use products appropriate for that. Although you shouldn’t need to take a second mortgage out to afford your hair care, if you’re spending good money on a quality salon cut and colour then you need to invest in your products to make your look last for you. Good products are usually worth the price, whereas an all-in-one shampoo and conditioning treatment that costs $2.50… probably not. Especially for my babes who style their hair with heat, the tools you use matter. The downside? Definitely the cost. Build your hair wardrobe as you go by adding quality brushes, combs, hairdryers and styling tools. A fantastic find is something called AfterPay, it’s how I bought my Parlux light hairdryer that gave me the ability to pay it off over time. You might be a little more financial than me, but I’d prefer to pay off the big ticket items so I still have funds to buy new products when I’m in every eight weeks! … Want to see my hair wardrobe? 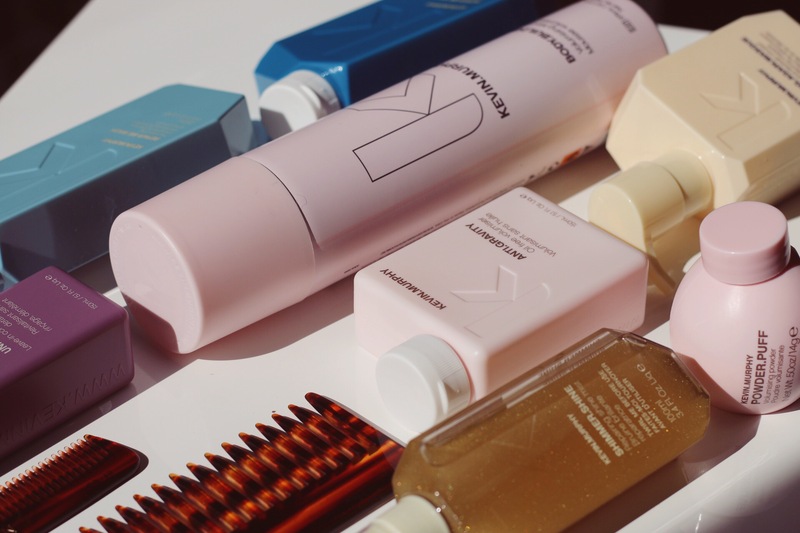 I’m a bit of a brand junkie for Kevin Murphy. Mainly because their products are a match made in heaven with my hair, but also I’ll admit that 5% of the reason is because the packaging is totally Instagram-worthy. I use a Kevin Murphy shampoo and conditioner and change up the one I use seasonally. Right now I’m using the Repair.Me Wash and the Repair.Me Rinse to ensure my tresses stay in tip-top shape with all my heat styling. For days when my scalp is feeling a little flakey and not-so-cute, the De Lorenzo Tricho system is amazing! The packaging isn’t as cute at KM, but it works so well as eliminating dandruff. And for when I have the time a leave-in treatment is always a good choice, specifically the Kevin Muphy Young.Again Masque. Whether I’m blow-drying smooth or with lots of bounce, I need body in my hair – especially the roots. For that reason, I double mousse my hair with the Kevin Murphy Body.Builder Mousse. This product gives great hold with blowaves or whatever style I choose to do. To keep my ends in check, I spray through the Untangled leave-in conditioner by KM. INSIDER TIP: IF YOU COLOUR YOUR HAIR, LISTEN UP! L’OREAL HAIR TOUCH UP SPRAY IS THE FIRST PURCHASE YOU NEED TO MAKE IN YOUR HAIR WARDROBE. IT’S TOUTED AS A ROOT CONCEALER THAT COVERS ALL GREY. IT’S ALSO A HANDBAG FRIENDLY SIZE AND PERFECT FOR WHEN YOU CAN’T GET TO THE HAIRDRESSER. You’d never use a cotton bud to perfect your signature eye look, so the same can be said for expecting wonders out of a dodgy brush. For combs, my preference is Mason Pearson (so Insta-worthy FYI), for blow-drying brushes I love GHD and I can’t go past my hot pink Parlux Light to perfect the look. I seriously could never look to any other hairdryer after purchasing it. Although I am a beauty enthusiast, hair is something I always need a little help with – especially with the hundreds of available products out there. If you’re like me and a little overwhelmed at how you’d actually classify your hair to work out the products you need, book in for a blowave. It gives you the time with your hair stylist to start and build your hair wardrobe.